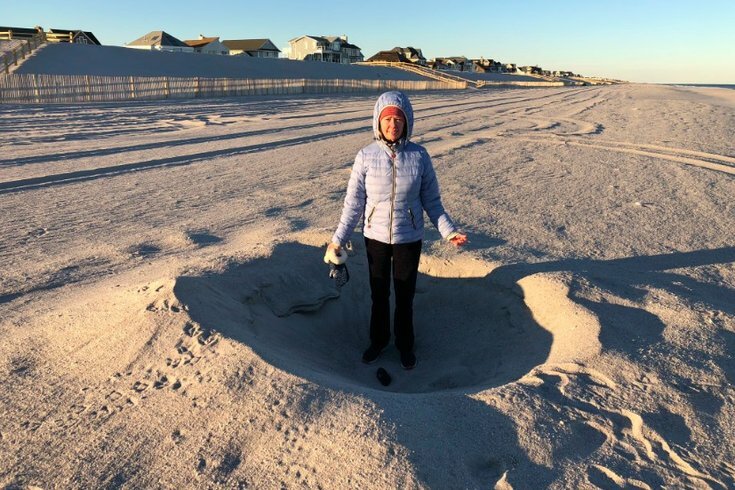 Jean Muchanic stands in the five-foot-wide crater found on Toms River beach last week, where she and her sister Nora think they found a meteorite. Jean and Nora Muchanic, formerly a reporter for 6ABC, were walking along Toms River beach last week when they found a curious five-foot-wide hole in the sand – and a questionable rock at the center of it. The sisters told NJ.com that the rock they found has some characteristics consistent with meteorites, specifically how the object's two surfaces differ in texture – one side is dull and smooth, and the other is rough and layered. It's also dark black, they said, which made it stand out from a typical rock found from the ocean. The discovery comes just shortly after nearly 600 people reported seeing a bright, falling fireball in the sky last Wednesday, including many in New Jersey who captured footage of the mysterious display. The American Meteor Society confirmed the fireball was caused by a meteor, burning very brightly as it passed through the Earth's atmosphere. Some experts aren't sold that the rock the Muchanic sisters found is actually a meteorite, however. One physics professor, Joseph Trout of Stockton University, told NJ.com that meteorites are usually found as disintegrated pieces, ranging in size from small pebbles to fist-size rocks. Nonetheless, the sisters plan to soon take the rock to the Franklin Institute and see if the museum can identify it.